Its outer surface is rough and gives attachment to the occipitalis and posterior auricular muscles. It is perforated by numerous foramina (holes); for example, the mastoid foramen is situated near the posterior border, and transmits a vein to the transverse sinus and a small branch of the occipital artery to the dura mater. 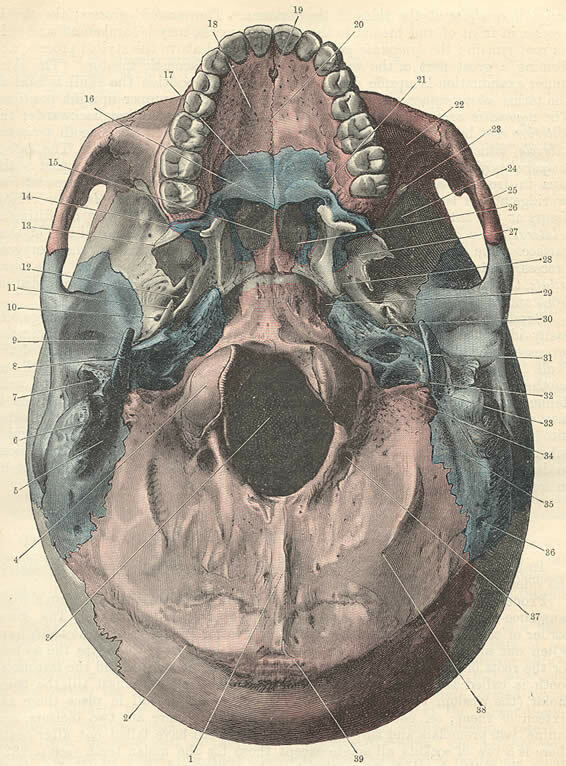 The position and size of this foramen are very variable; it is not always present; sometimes it is situated in the occipital bone, or in the suture between the temporal and the occipital. The mastoid process is located posterior and inferior to the ear canal, lateral to the styloid process, and appears as a conical or pyramidal projection. It has variable size and form (e.g. it is larger in the male than in the female). It is also filled with sinuses, or mastoid cells. The mastoid process serves for the attachment of the sternocleidomastoid, the posterior belly of the digastric muscle, splenius capitis, and longissimus capitis. On the medial side of the process is a deep groove, the mastoid notch, for the attachment of the digastric muscle; medial to this is a shallow furrow, the occipital groove, which lodges the occipital artery.